Two Chicks On Books: Blog Tour- QUEEN OF HEARTS by Colleen Oakes A Guest Post & Giveaway! 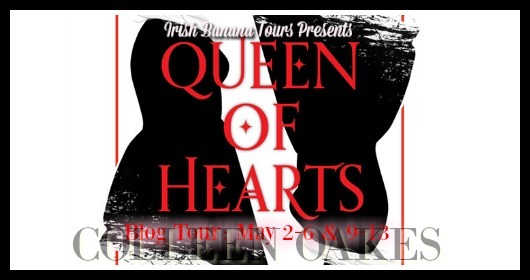 Blog Tour- QUEEN OF HEARTS by Colleen Oakes A Guest Post & Giveaway! 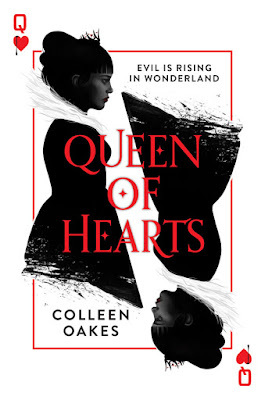 I am thrilled to be hosting a spot on blog tour for QUEEN OF HEARTS by Colleen Oakes! I have a guest post with Colleen (she answered a few pf my topics so I'll post them all) to share with you today! And make sure to enter the awesome giveaway for a finished copy of the book! Haven't heard of QUEEN OF HEARTS? Check it out! - Dinah and Wardley in the stables, surrounded by the pink snow. It’s just so romantic and cozy feeling. I love their relationship. - The Black Towers. It’s a mysterious place with a wicked past and a strong commitment to being as creepy and claustrophobic as possible – and a joy to write. - Any scene with Morte. Morte is a representation of Dinah herself and so it’s fun to play with the symbolism. - Dinah and Vittiore having tea. Two women who have both been terrorized by the same man, set up as enemies, finally getting face to face time. They are of the same family and yet utter strangers. Vittiore is the polar opposite of Dinah in so many ways, and so that’s really fun to explore. - My favorite, favorite scenes in the book are between Dinah and Charles, the Mad Hatter. Their relationship is so special. And Why from the Queen of Hearts POV? Every villain deserves their own story, I feel, especially female villains who are often shoved into convenient boxes for a male hero. I knew there was so much more to her story. I wanted to see exactly how a princess becomes a villain, especially one best known for her uncontrollable rage. 3 winners will receive a finished copy of QUEEN OF HEARTS, US Only. Gosh I am so excited to read this book ahdfkljklanfdljdj I CANNOT FREAKING WAIT! I love fractured retellings of Wonderland! Thanks for the giveaway! Pink snow!! Why doesn't that really exist? I love villain povs. I love retellings and the synopsis promises so much fun to read! Def need to read this!!! I adore retellings. This is the one that I have been waiting for!!! Cannot wait!!! I've seen a preview of the first few chapters, and it seems amazing! I'm kind of excited for this book. Alice's Adventures In Wonderland is one of my favorite classic books. Plus, I enjoy retellings.